Everyone has a favorite season and my favorite season is Spring. May be because I was born in the spring, but much more than that I feel spring is a new beginning and coming out from the cold of winter is refreshing, vibrant, and brightness. Cooking with spring ingredients are soft and warm energy. 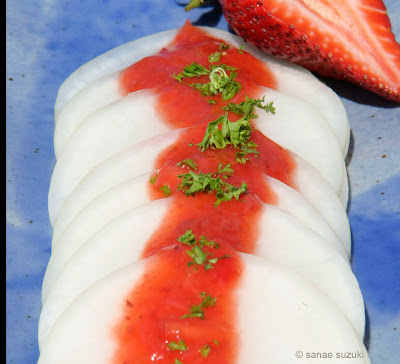 This season, how about making Spring Daikon Salad with Strawberry Umeboshi dressing? Spring daikon is much sweeter and mild taste than autumn and winter daikon. It's very delicious, easy to make and healthy. I purchased all the ingredients at Santa Monica Farmers Markets except the organic California umeboshi plums that are our friends, Kazuko who made them in Northern California which you can buy at our restaurant Seed Kitchen and purchase through our website. 1. In a medium saucepan over medium-high heat, bring the water to a boil. Add the sliced daikon to the pot and blanch for 30 seconds or less. Drain and allow daikon to cool. 2. Transferdaikontoindividualservingbowls, drizzle with Strawberry Ume Dressing, and garnish with mint or parsley. In a suribachi, mash the chopped strawberries using your clean hands, then use a surikogi to puree. Pour the dressing over daikon. other vegetables. Sprinkle with mint or parsley garnish.